Archive for tag "electric mobility"
Ecosummit TV: Although he didn’t leave our sponsor dinner as the first guest the night before, Knut Hechtfischer delivered his best pitch at ECO14 Berlin so far. Ubitricity has got a great story that is acknowledged by an increasing number of VCs and industry experts. This year Ubitricity entered Cleantech Group’s 2014 Global Cleantech 100 – next to 7 more startups that pitched at Ecosummit in the past. Moreover, the Berlin-based smart green startup won EDF Germany as strategic investor and has got a product ready for market. Ubitricity wants to make smart charging affordable by enabling mobile metering in the virtual power grid. They bring together electric mobility and mobile electricity in a very simple, yet powerful way. The key idea is to put the intelligence into the charging cable. This allows for a cost reduction of 90% when installing smart sockets (thin charging stations) in street lights, garages and any other place you can imagine. In 2015, Ubitricity rolls out in Germany and we are curious to see how EV drivers, fleet operators, municipalities and utilities adopt this smart charging service. Ecosummit TV: This year Ecosummit partnered with Tesla Motors to provide Model S test drives and first-hand insight into the automotive future invented in California. Following a 100% electric strategy since its foundation in 2003, Tesla forces the big automakers to accelerate their electric transformation, too. In February, Philipp Schroeder joined Tesla from Sonnenbatterie and now manages sales and business development in Germany and Austria. At ECO14 Berlin, Philipp agreed that Tesla is on its way to become the most valuable car company in the world. When we wrote about the super hero of the smart green economy in May 2011, Tesla was valued at $2.6B. Now it has a market cap of $30.6B and expects to deliver 33.000 cars to its customers in 2014. BMW, the German car maker with the strongest electric mobility strategy thanks to the purpose built EVs i3 and i8 and the inhouse carbon fiber production, is valued at $60.3B delivering 2 million cars this year (BMW investor presentation Nov 2014). When Tesla’s Model III, priced at $35.000, starts racing against the BMW 3 series in 2017, we will find out quickly how car drivers really think when making their next purchase decision. Ecosummit TV: Alexander Zosel gives an update on the development of their electric Volocopter VC200 at ECO13 London. E-volo was founded in 2011, was funded by the founders with €450K and raised €1.2M in an amazing crowdfunding round on Seedmatch in November 2013. Moreover, the German Federal Ministry for Economic Affairs and Energy granted €2M to contribute to the multi-company project development budget. The first unmanned test flight of the 2-seater VC200 was carried out on 17 November 2013 in Karlsruhe. Currently, E-volo works on the temporary certification from the German aviation authority for their ultralight aircraft (maximum takeoff weight of 450 kg) to start manned test flights. Initially targeting the aerial sports market E-volo has the vision to become a global market leader for urban aviation in the next 10 years. Risk-friendly VCs that love high-tech made in Germany and electric aviation should get in touch with Alex. 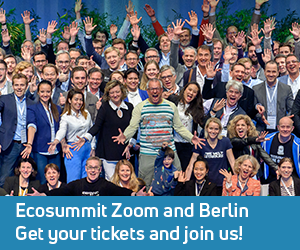 Full disclosure: Ecosummit is one of E-volo’s crowd investors. Ecosummit TV: Knut Hechtfischer pitches Ubitricity at ECO13 Berlin. The Berlin-based cleantech startup develops a cost-efficient charging solution for electric vehicles by putting the intelligence into the charging cable. This allows mobile metering wherever the user wants to buy electricity from. Recently, they became famous for integrating their solution in street lights. Up to now, Ubitricity raised €5.4M and is backed by Earlybird, IBB Beteiligungsgesellschaft and Heinz Dürr (largest shareholder of Dürr, former CEO of AEG and Deutsche Bahn). Founded in 2008, Ubitricity plans to launch Mobile Metering in 2014, just-in-time when new electric cars hit the market. Meet Knut at ECO13 London next week to get an update and learn about their high risk, high return investment opportunity. That’s what venture capital is all about, isn’t it? Ecosummit TV: Electric mobility on 2 wheels grows a lot faster than on 4 wheels. Dirk Dens pitches Govecs at ECO13 Berlin and shows how Govecs is surfing this VC-friendly trend. The Munich-based late stage startup is backed by Gimv and makes very cool electric scooters that are manufactured in Wroclaw, Poland. Govecs makes scooters not only for consumers but also for companies, especially urban delivery services. The new trend is scooter sharing and Govecs recently started the first project together with Ecooltra in Barcelona. If Govecs continues to execute its strategy well, they may be an exit candidate rather soon. 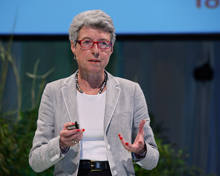 Ecosummit TV: Fabienne Herlaut pitches Ecomobilité Ventures at ECO13 Berlin. The Paris-based multi-corporate VC is focused on investing in sustainable mobility startups in Europe. Ecomobilité Ventures is financed by French national railway operator SNCF, mobile telephone operator Orange and energy company Total. The €25M fund is invested in 3 startups: Move About, EZ‐Wheel (ECO13 London) and Ouicar. At the moment, Fabienne works on new investments into promising startups as well as expanding the financial muscle of Ecomobilité Ventures with the help of more corporate limited partners. We are proud to have Fabienne among our Ecosummit Advisors and look forward to meeting her again at ECO13 London next week. 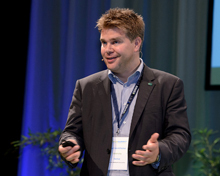 Ecosummit TV: Alexander Zosel pitches E-volo at ECO13 Berlin. The German cleantech startup develops an electric helicopter that will revolutionise urban aviation within the next 10 years. The Volocopter is developed by a consortium of companies and universities that received a €2M grant from the German government. Moreover, the German aviation authority defined a new class of aircraft specifically for the Volocopter. As of today, E-volo plans a slow market entry with a pre-series of 10 Volocopters in 2015. As the new electric helicopter category is a potential multi-billion market opportunity, E-volo will soon realise that they need to raise substantial amounts of venture capital to guarantee high-quality production on the ground as well as safety in the air. For now, they continue their startup rock’n’roll pioneering electric aviation and inventing new PR stunts. 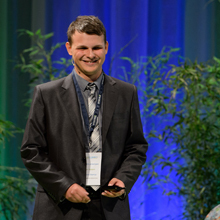 Ecosummit TV: Rastislav Lauko pitches Greenway from Slovakia. The Bratislava-based smart green startup provides an electric mobility transport service for corporate customers. Their full-service approach uses converted transporters that get an electric motor and battery swapping system. This investment is worthwhile as the transporters travel on fixed daily routes at least 70.000 kilometers per year. Greenway’s EVs have a reach of 200 km and the battery swap takes less than 7 minutes. Bankrupt Better Place should take a look at this Eastern European startup and their very focused business strategy. As Greenway has got their first customers they now want to raise €3M to scale their business in Slovakia and prepare market entry in Austria and Czech Republic. Ecosummit TV: First the bad news: after burning $850M in 6 years Better Place files for bankruptcy. That’s not what you call a lean startup. The electric mobility operator had to accept that car makers don’t support a global startup standard for switchable batteries. Now the good news: peer-to-peer ride sharing startup Lyft raises $60M for global expansion from Andreessen Horowitz. To fight off the professional taxi and limo driver lobby, Lyft drivers get donations rather than payments from their riders. But VCs love transactions whatever they are called, especially if they smell like Airbnb on the road. Here in Europe, we eat humble pie. At ECO12 Düsseldorf, Fabienne Herlaut (Ecomobilité Ventures) discusses profitability with Alexander Zosel (E-volo), Oliver Lünstedt (Carzapp), Klaus Dibbern (Flinc) and Thomas delos Santos (Innovative Mobility). Some inspiration from the US may help. Financing cleantech startups is a tough game these days. You need a strong team, product market fit and, even better, customers and revenues. 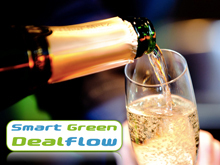 In this difficult market environment, it is a great pleasure to report that 6 smart green startups managed to raise new venture capital: Ubitricity (around €3.5M, Germany), Saperatec (€3.3M, Germany), Skeleton (€2.2M, Estonia), Waste2Chemical (undisclosed, Netherlands), O-Flexx (€2.4M, Germany) and Romo Wind (€4.8M, Switzerland). The active cleantech VCs include Earlybird, IBB, NRW Bank, HTGF, eCapital, Dutch Greentech Fund, Emerald, Yellow&Blue, ABB and b-to-v. Let’s take a closer look at the startups and their new investors. Ecosummit TV: Not many people have the guts to found an electric vehicle startup these days. Thomas delos Santos, CEO of Innovative Mobility, is one of them. His pitch at Ecosummit Düsseldorf 2012 provides the full story behind the electric microcar called Colibri. The Colibri will be unveiled at the auto show in Geneva in March 2013. The light electric vehicle (LEV) for city dwellers will cost €8.9K plus monthly battery leasing costs of €55. Colibri shall hit the market in 2015 and can be pre-ordered in 2014 – provided that Thomas manages to raise the rather large funds needed for series development and production. We cross our fingers as we want to see the smart green Colibri on the street. Ecosummit TV: At Ecosummit Düsseldorf 2012, Fabienne Herlaut, Managing Partner of Ecomobilité Ventures, presents her multi-corporate fund which is focused on investing in ecomobility startups in Europe. Ecomobilité Ventures is financed by French national railway operator SNCF, mobile telephone operator Orange and energy company Total. While the €25M fund is still young, it already invested in 3 sustainable mobility startups: Move About, EZ‐Wheel and Ouicar. Fabienne is looking for a fourth corporate investor from the automotive industry, preferably from Germany. At the same time, she is always interested in meeting fundable ecomobility startups that look for smart green investors with industry expertise. Ecosummit TV: Knut Hechtfischer pitches Ubitricity. The Berlin-based startup wants to disrupt the charging infrastructure game for electric vehicles (EV) by rolling out low-cost electric sockets. The concept is called mobile metering and is based on putting the intelligence into the charging cable rather than the charging station. Ubitricity is an ambitious Lean Cleantech Startup that develops and produces a lean and cost-efficient product together with a value web of suppliers. We look forward to enjoying Knut again on stage at ECO12 Düsseldorf. “Our goal is to become the largest provider of clean distributed energy in the world.” Elon Musk, super hero of the Smart Green Economy, is doing it again. As Chairman and biggest shareholder, Elon prepares for his third IPO after PayPal (2002) and Tesla Motors (2010) and positions Solarcity as the smart green utility of the future. Solarcity just filed for its long-awaited Initial Public Offering on NASDAQ by registering the Form S-1 with the SEC. While IPO date, volume and share price are to be defined, reading this investment prospectus is highly recommended. Update: On 27 November 2012, the price range ($13 to $15) and the volume (10.065.012 shares) was announced (S-1 Amendment 27.11.12).